Call me old fashioned but I still like the feel of the pages of a book in my hands; still love turning the pages; still love random slips of paper tucked in as impromptu bookmarks. But I have to admit, I haven’t been reading as much the last few years. In fact, I’m lucky to get through the cooking magazines that arrive in the mail each month. I have recently rediscovered my local library though. Amazon has made it so easy to get the few books I do read delivered to my door but truthfully I hardly ever read the same book twice, so why am I paying to own all of them, only to donate them to the library eventually anyway? Why not cut out the middle man and start at the library in the first place? So, there I was at the library, book in hand working my way to the check out counter when I passed the shelves of new releases and staff choices. The title that caused my abrupt halt? 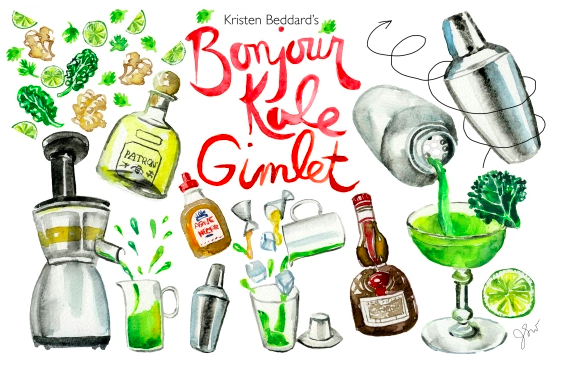 Bonjour Kale by Kristen Beddard. I know that kale is pretty much old news now, but first, my friend Laura pretty much detests anything kale so I’m always looking for things to taunt her with and second, I’m still ok with kale. It makes regular guest appearances in my salads and smoothies. Full review of the book to come, but I love that the pages are filled with not just kale recipes – but really interesting kale recipes. Like this one for a Water Tower Gimlet. Kale? In a gimlet? This I have to try. 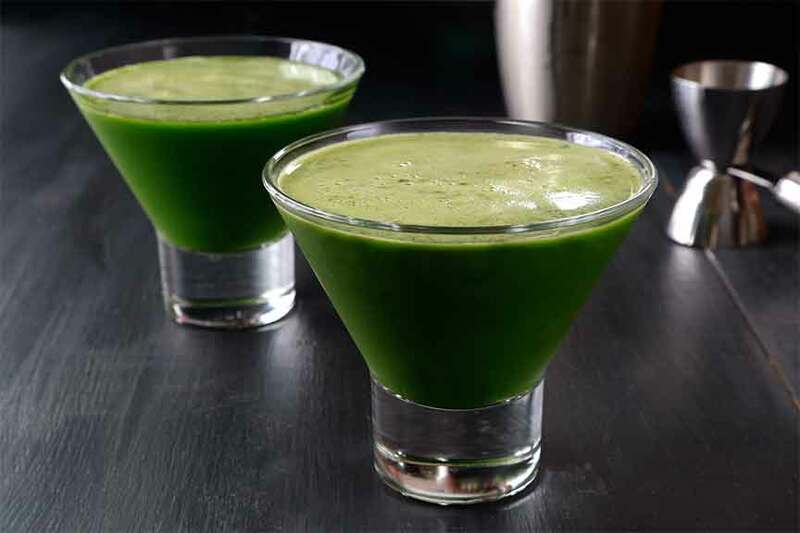 While this tasted a bit too healthy for my husband, to me it was just like my morning smoothie… with benefits. I hope you enjoy and for more cool kale recipes make sure to check out Kristen Beddard’s website. 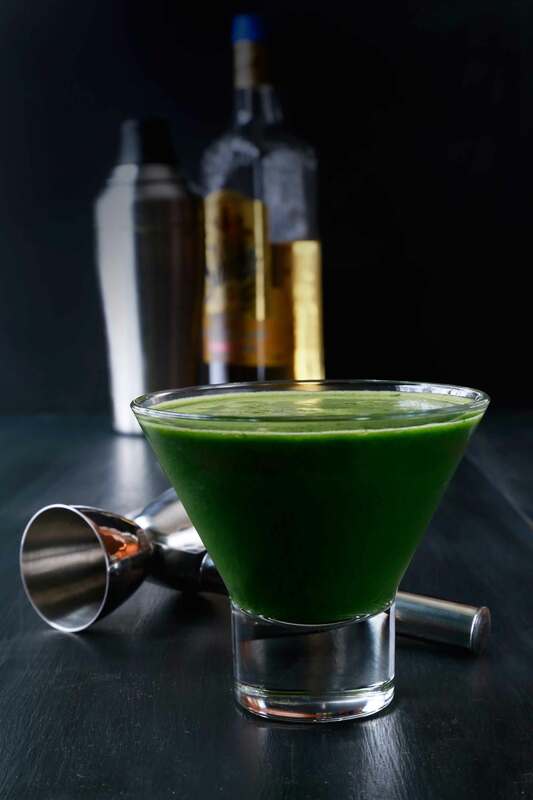 This twist on a traditional gimlet usually made with vodka or gin, this one uses tequila and a hefty dose of kale juice. Juice the kale and ginger in a juicer. Measure 1 shot of the juice and combine with the lime juice, tequila, trip sec, agave syrup and cilantro in a shaker with 6 ice cubes.